Are you aware that President Muhammadu Buhari is giving Nigerian youth N10,000 as new year gift according to a report? Are you confused and want to know whether the claim was true or fake? Below is a post I personally researched and composed to guide you through this dilemma. Most recently, people were sending a post across the social media; Facebook, Whatsapp etc that Mr. President is giving out money gift for the New Year and a form is opened through the link which people can apply from. This message was, in its entirety, a false claim. Mr. President, through any organization or executive has not announced of any free money. Kindly disregard should posts. If you critically look at the said form, it was the handwork of some fraudulent people. A federal government form can’t be this cheap. 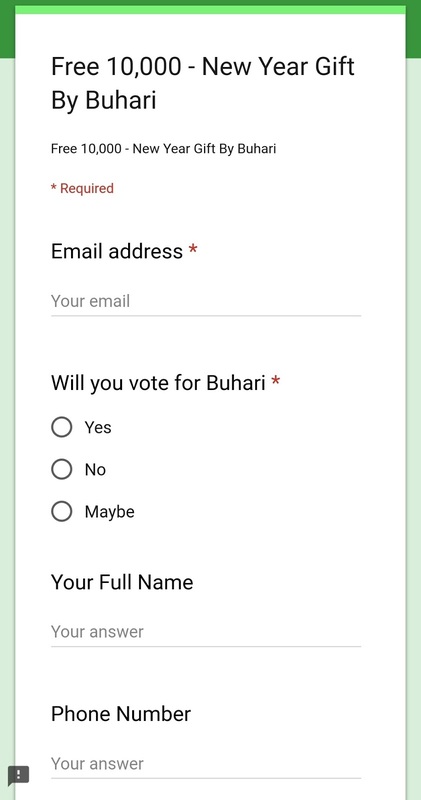 The application form was designed by FREE Google form. 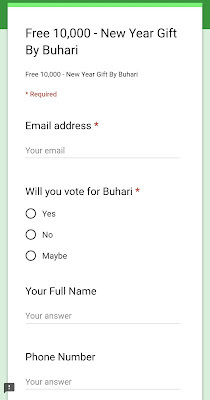 Imagine Buhari will need free form to collect applicants’ data. That’s not true! Whether they call it grant or loan, Buhari is not dashing money to the youth as a New Year gift. A man has called me to ask if this Free 10,000 is true. I made efforts to convince him that it wasn’t. I warned him to beware of fraudsters. To my dismay, the guy insisted on trying it since he has nothing to lose. “After all, they didn’t ask me to pay any money”. Now, check the form again. These people want to collect your personal information including your email address, phone number, name etc. They can use these details against you in your bank, business and so on. This is a smart way scammers do collect people information. Before you know it, they can be contacting you through SMS, email etc in order to take advantage of you elsewhere. Recently, the federal government, under the leadership of President Muhammadu Buhari and his vice, has been giving out what they called “Trader Moni”. This is not a free New Year money. It is only opened to the market women and men who applied through their local government, market association etc – not through the internet. Another free money was approved for disbursement among the identified poor families in the country. The cash payments are part of the Nigeria National Social Safety Net Program which helps poor families and Switzerland is believed to have returned about $1bn to Nigeria over the last 10 years. This is not through the internet as well. Apart from the two well-known and officially announced money being giving out by the federal government but not under the personal name of Mr. President, claims that you can get money from President Buhari is fake and should be treated as thus.